After leaving the Redwoods, I returned home to Portland, Oregon for a week to get my act together for the Great Divide Trail. I’ve never returned home mid summer like this and it was WONDERFUL! I honestly LOVE living in Portland and am soooo happy with where I return HOME. I got to sleep in most days and let my body rest. I saw many of my friends and the families I work with. I got to take daily showers and sleep in a bed. I didn’t eat a single Clif Bar! I took a well needed break from blogging…it was luxurious! The only downside of being home is that I had to do all the dreaded prep and planning still left for the Great Divide Trail, ugh. When I got home, there were many care packages that had been sent over the past three months from family and blog followers. 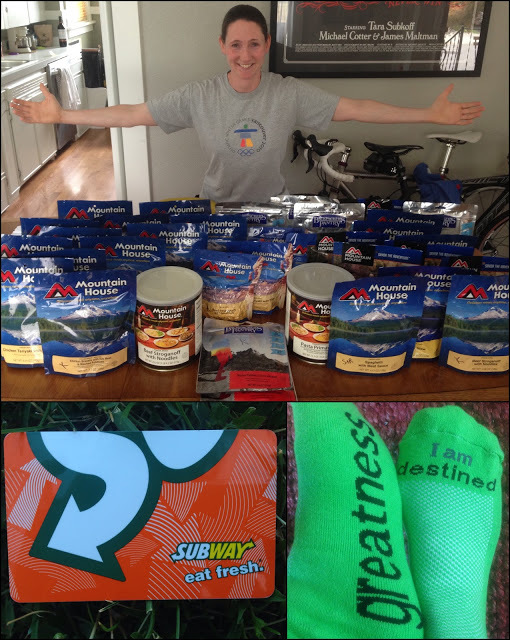 Some of the highlights were some awesome “wired green” socks, a Subway gift card, and enough Mountain House dinners to cover the rest of the summer! I can’t thank everyone enough and it really is a boost for me. I pride myself on earning my own hikes, but these things are bonus things that I would never treat myself to, so THANK YOU for that!!! I’ve written the names of those who sent things on the items and you will be out there with me in a way. It makes me smile each time I pull out a bar or dinner with a person’s name on it or an inspirational note from a friend. I like to think that everyone is out there with me through the blog and this is just another level of that. THANK YOU ALL for your support and words of encouragement! Organizing the maps…yep, it’s gonna be grizzly country! I mentioned that I was fortunate to get to see some of my friends while I was in town. What was even better was that they were able to help me with some of the resupply stuff too. 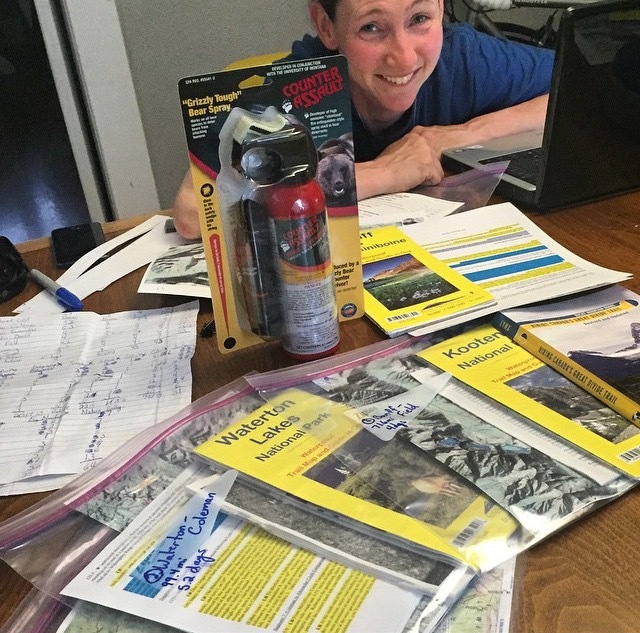 My friend Jennifer (yes, the one that joined me for a section of the PCT in 2011) luckily really enjoys the resupply aspect of planning and she helped me with both the Hayduke and GDT resupplies. 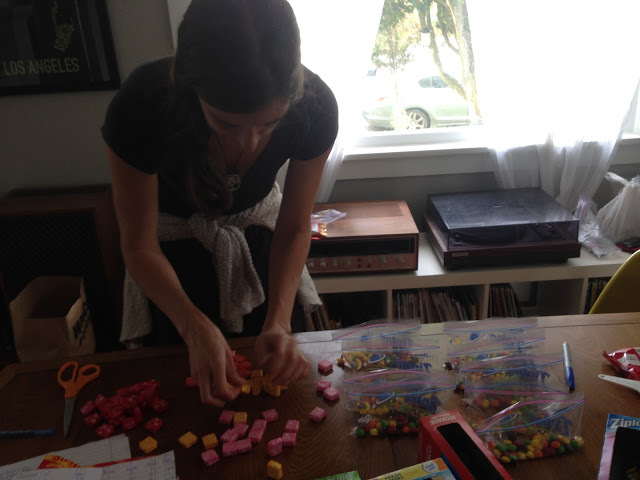 Here she is voluntarily making the effort to portion out my Starburts/Skittles bags so I have the equal number of flavors in each bag…Now that’s a quality friend! You rock Jennifer! 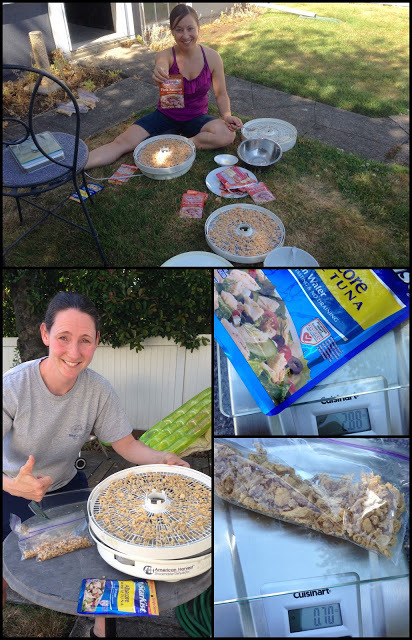 I also was lucky enough to have BaconBit open for a day to come over and finish up the resupplies with me…and also bring over a dehydrator for my for try at dehydrating. I eat a foil packet of tuna or salmon each day for lunch along with tortillas and string cheese. It is a significant amount of my food weight and Rockin’ told me that she just found out about dehydrating tuna/salmon and that it saves over 2oz/pkg. I had to try it! We dehydrated for my longer legs and I have yet to test it, but Rockin’ says it works. Here are instructions on how to do it yourself if you’re interested. Be warned, you should do this outside or in a garage if you are working with strongly scented foods! I can say that with the time and effort put in, I’ve yet to convert to this whole dehydrating process, but maybe someday I’ll give in…for now I’d rather save the time, effort (and stench!) and carry the weight. We’ll see how it goes with the ones I packed! Thank you BaconBit for being there to ease me into this new territory! 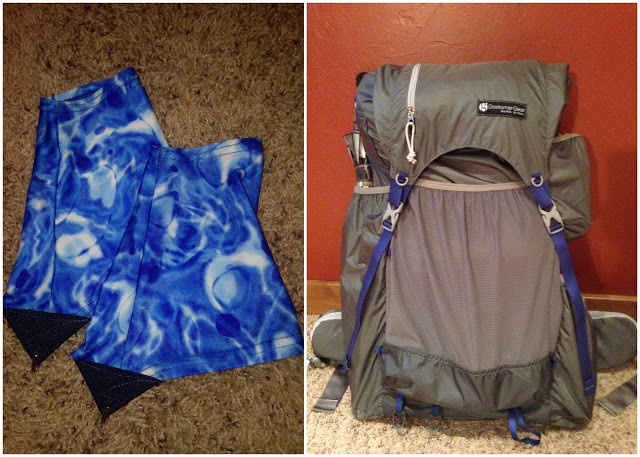 -Thanks to Gossamer Gear for the new Mariposa pack after the Hayduke rocks ate my other one up quite a bit. 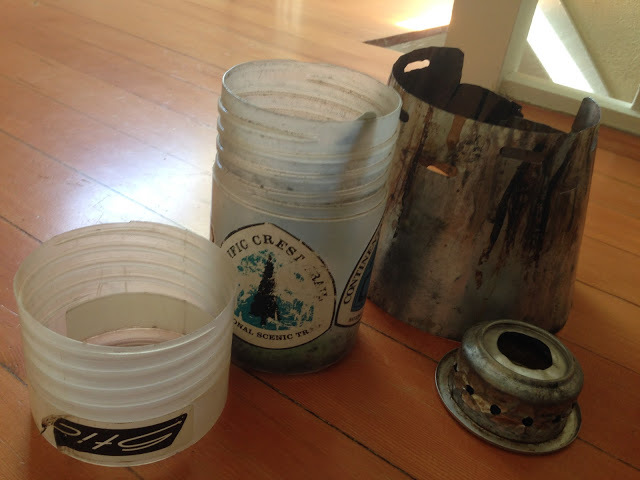 -Thanks to Dirty Girl Gaiters who has always been there and such a wonderful support! -The same goes for StickPic (not pictured) who was one of my earliest supporters. Thank You! The StickPic is probably the smallest piece of gear that has made the biggest impact on my video/photography/blogging. New Dirty Girl Gaiters and Gossamer Gear Mariposa Pack. -Thanks to Sawyer for providing me with new Squeeze Bags since I managed to puncture my last ones with cacti. I also use the amazing Sawyer Sunscreen, which somehow kept me pale in the desert for two months! A new product I will be trying out is the Sawyer Insect Repellant. It comes in varying levels of strength both in spray and lotion form. I am sure I’ll get plenty of bugs on the GDT to test them to their fullest. Sawyer has amazing products that are used worldwide and have great videos on their website with detailed information on them too. 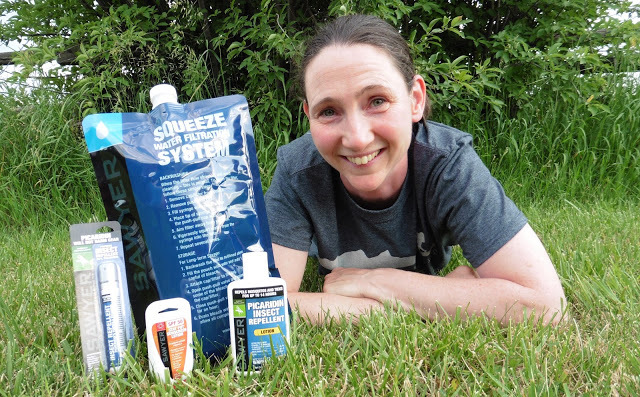 Squeeze bag, Insect Repellant, and Suncreen from Sawyer. -Thanks to Trail Designs who noticed I’ve been using the same Caldera Stove set for almost 10,000mi and offered to send a new shiny one! A Trail Designs Caldera Cone set after almost 10,000mi.